The BlackBerry Pearl 8100 is a best-selling smartphone that you have probably forgotten. Shipping in the millions during 2006 and 2007, the Pearl was a huge sales success, even against mighty devices such as the Nokia N95 and the original Apple iPhone. A decade ago it was email driving smartphone adoption amongst consumers rather than other factors. Web browsing sucked on 2006-era smartphones because publishers didn't make the mobile versions of websites that they do today. And although you could download applications onto your smartphone it wasn't the easiest thing to do. Facebook and Twitter were still in their infancy, so most communication was done by email. And nothing did email better than a BlackBerry. The Pearl was very much a consumer device, ditching the QWERTY keyboard and wide body (found on the BlackBerry 8700) for a hybrid keypad and a shape much closer to a standard "candy bar" phone. It was the first BlackBerry device to feature a camera (because corporate customers didn't like cameras) and be able to play MP3s and store data on a microSD card (because corporate customers didn't think it appropriate). 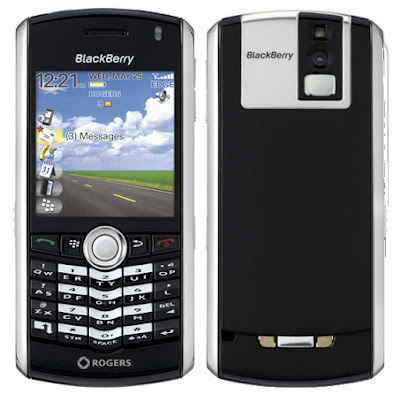 It was also the first BlackBerry to discontinue the traditional side-mounted jog-wheel and replace it with a trackpad.. not quite as intuitive as a touchscreen but close. It didn't have 3G or WiFi though, but email use didn't really need that. The screen itself was probably the best in class, and on top of that there were a range of applications available, on what was for the time a highly polished and rather fun operating system. Although BlackBerry purists looked at the Pearl with distaste, it wasn't aimed at them at all.. and it successfully opened up a new market helping to create six years of rapid growth for makers Research in Motion. Some variations followed over the years, eventually leading to the final model in the series - the Pearl 3G - in 2010. All the Pearls was successful commercial products, but in the end consumers lost interest in this type of device. Today prices for the 8100 vary hugely, ranging from a few euro each to several hundred depending on condition and colour. It seems that even a decade later, this little device still has its fans.